Salisbury, Md. 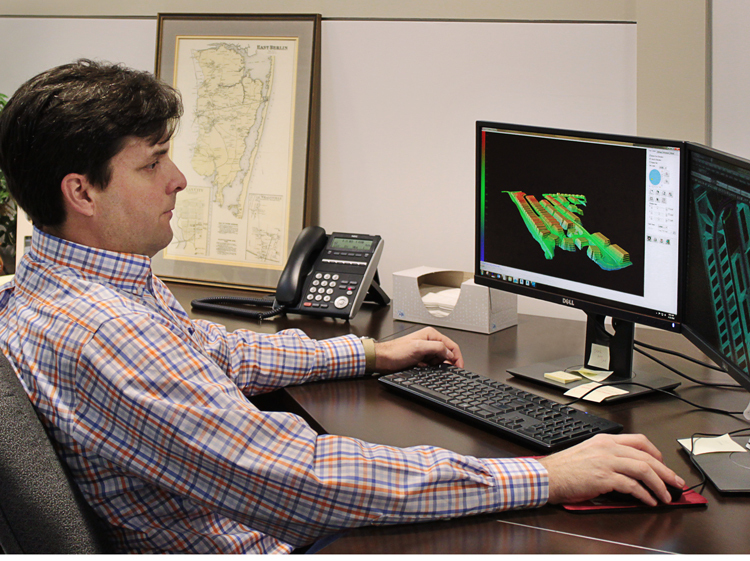 — Davis, Bowen & Friedel, Inc. (DBF) announced enhancements to the surveying services provided by the firm with the addition of state-of-the-art machine control technology. This addition expands on DBF’s comprehensive list of capabilities, allowing the firm to provide time and cost savings in the field for clients with large-area construction projects. This technology offers an alternative to a traditional construction stake-out survey, providing a seamless transition from 3D design to mass grading. What used to take days and weeks for a survey crew can now be achieved in a few hours, providing clients with complete and accurate data. “The accuracy of DBF’s machine control models has saved us an extensive amount of time in the construction process,” said RJ Andrews, Christiana Excavating Co, Inc.
Design changes can also be electronically updated to the GPS-equipped earthmoving equipment for instant use without the need for a physical re-survey. Bulldozer blades automatically tilt, lift, and adjust to grade sites and cut roads based on the designed grade plan provided by DBF. In addition to this new service, DBF continues to provide surveying services throughout Delmarva and beyond. DBF has six survey crews, two licensed surveyors, and multiple support staff whose depth and breadth of experience is extensive.